Beautiful kids' book following the adventures of a boy who waits for, and then witnesses, the first Christmas. As children wait with anticipation for Christmas, they can follow the adventures of Benjamin­­– the littlest watchman–who waits for and then witnesses the first Christmas. Kids will be gripped by what Benjamin saw, and will be excited by the nativity story all over again. Can be read to children aged 3-5, or read by children aged 6-7. A perfect gift for advent as you help children focus on Jesus at Christmas. Written by Scott James, author of The Expected One. Can be bought with accompanying Jesse Tree advent calendar for family advent devotions. 8.7" x 8.7" x 0.1"
One of the key emotions children feel as Christmas approaches is anticipation. This beautifully written and illustrated story connects that emotion with the expectation leading to Jesus’ birth – and the hope we have for His return. 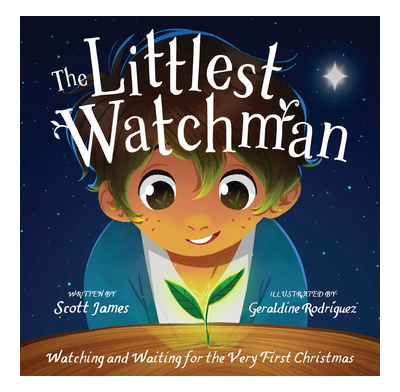 The Littlest Watchman will not only encourage our children as they contemplate the coming of Christ, but also encourage the child in each of us as we eagerly wait for his return! This is a beautiful story, full of wonder and expectation. I look forward to reading this with my own children, sharing with them the wonder of Christ's first coming and teaching them to wait expectantly for his return, even when it's hard to wait. A fictional story about little boy watching a tree stump which then grows when Jesus is born so it is a mix of fiction and the Bible especially focussed on the Old Testament and the root of Jesse. What a special little book. Amazing how a simply told fictional story can hold such deep nuggets of God's revelations to His creation. Art work is beautiful.A great addition to help bring the big picture into the traditions of the Advent season.Thanks to all involved in bringing this book to us.